According to the Bureau of Justice statistics, about 67 percent of elder abuse victims are women. In 2011, the number of elderly women in the United States was approximately 23 million, while the number of elderly men in the U.S. was about 17.5 million. While the difference in population may be partially responsible for the link between abuse and gender, there are also many risk factors that may make women more prone to elder abuse than men. Women often tend to be seen by abusers as easier or weaker targets than men. Societal views may also condemn elderly women, while placing more value on elderly men. In addition, women tend to have longer life expectancies, and more often live alone, which may put women in a position that is more susceptible to abuse. Elderly women are more prone to crippling disabilities such as osteoporosis and Alzheimer’s disease, and often take longer to recover than men. Elderly patients that are disabled have a much higher likelihood of being abused than elderly patients that are not disabled. Abusers often feel secure that there will be no consequences for abusing a disabled victim, while those without disabilities may be more capable of reporting the abuse. Women are also much more prone to elder sexual abuse than men. One study published in the Journal of Elder Abuse and Neglect found that elderly women were six times more likely than elderly men to be sexually abused. The majority of sexual abuse victims reside in nursing homes or other institutional facilities. While sexual abuse is more likely to occur in institutional facilities, elder abuse in general occurs in home residences about 90 percent of the time. Since elderly women often live alone, family members or other trusted individuals may take advantage of the situation by moving into the patient’s home and beginning to assume control of assets and finances. This can begin a cycle of financial abuse. Other forms of abuse may also begin, as the caregiver assumes a dominant role in the household. Studies have shown that as many as 95 percent of nursing homes may be understaffed, leading to high rates of abuse and especially neglect. Since women have a longer life expectancy than men, and the population of elderly women is greater, women are almost twice as likely to reside in a nursing home as men. These factors contribute to the higher number of elderly women that suffer abuse and neglect while residing in nursing homes. Certain symptoms may indicate elder abuse against women. Since all types of abuse may cause psychological damage, family members and friends of elderly women should be aware of any behavioral changes that may occur. Behavioral changes that may indicate abuse include becoming withdrawn, refusing to participate in social functions or hobbies that were previously enjoyable, and becoming unreasonably fearful and paranoid. If elder abuse of a woman is of a physical nature, marks or infirmities may be indicative of the abuse. Signs of assault or rough handling may include bruising and lacerations. Signs of sexual abuse may include unexplained vaginal bleeding, or development of a sexually transmitted disease. Signs of financial abuse may be harder to spot, as abusers are often careful to make it appear as though the elderly abuse victim is well taken care of when visitors arrive. Visible signs that may indicate financial abuse of elderly women include malnutrition and insubstantial care based on known finances. Signs that may be indicative of abuse to bank employees or other financial associates include large withdrawals from bank accounts and irregular banking activity. Since women are often more vulnerable to abuse, it is prudent to educate women that may become targets of elder abuse. 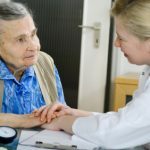 There are many organizations that focus on preventing elder abuse and assisting victims of abuse, so making elderly women aware of these organizations can help to combat the growing problem. Associates that are close to elderly women can also be alert for signs of abuse. Oman, Doug, Dwayne Reed, et al. “Do Elderly Women Have More Physical Disability than Men Do?.”American Journal of Epidemiology. 150 (8).February (1999): 834-842. Web. 26 Feb. 2014. <http://aje.oxfordjournals.org/content/150/8/834>.